Okay, ladies...confession time....what is it that you want to "confess" today?? My confession is this: I am tired. Very tired of everything. How is it possible that this happened? 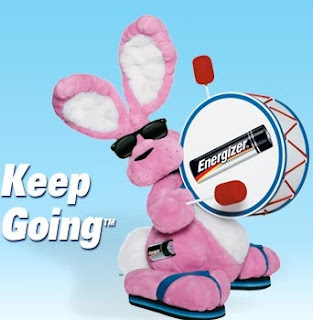 I mean, aren't Wives and Mothers supposed to be like the Energizer Bunny? You know...Always "On?" Well, this Energizer Bunny needs re-charged batteries, because I am s-l-o-w-i-n-g down. And, I believe I know what the problem is: I need some Me-Time. That precious time that never seems to happen. Oh, I know...I am a stay-at-home-slave Mom (ha!) and I should have just loads and loads of time to myself. After all, my children are teenagers and I don't have the demands of little ones anymore. And, therein lies the problem. When my 2 were smaller, I would eat when they did (so I always got my breakfast, lunch, and snacks) and I rested when they did. When they started school, I noticed that I felt the need to make every minute that they were gone productive ones. I kept up that regime for awhile, and then my illness took over and I was forced to slow down. Fast forward to the high school years: I have found myself doing that same pattern of productivity again. I want to accomplish so much during the day that I push myself to the limit. And, once again, I am experiencing burn-out. So, I decreed this past Wednesday as "Vacation for Slave Mom" day. I didn't do anything that remotely involved housework or office work. I read a book, watched a movie, rested, and made an easy supper. My hubby couldn't believe that I was serious about it. He even had to load/unload the dishwasher and straighten up the living room (he's off work right now). Then, I went to bed early. And, you know what? It felt MARVEOUS! How do you handle burn-out and what do you do about it?? As you go about your busy lives today, be sure to pause and say a prayer for those affected by the disaster in Japan. A.Marie, congratulations! Good for you for taking a day for yourself and making the best of it...or should I say, the "rest" of it? Hehe. Tired. Yes. So tired. I am also weary. On February 6th, my husband's G'pa died...on our son's birthday (http://wordsfromdug.blogspot.com/2011/02/disobedience.html). From there, we had a friend have surgery, we had a crisis that forced us to cancel our vacation, Hubby got the flu, Boy got sick, another surgery, a close friend had a lung collapse...another surgery, cancelled my birthday party, and now one of our dogs seems to be dying. We are awaiting a call from the vet this morning with more test results. I am the person who tries to stay positive for everyone else and who tried to see the bright side of things. If I need to confess, though, I JUST WANT A BREAK! I will admit, though...you HAVE had alot going on in your life lately!!!! I'm slowing down, too. I used to really be like that bunny, but I think I've just got into a bad habit of not doing as much, and then when I try to do more, it wears me out. I'm just flat out lazy sometimes. I would like to work my way back up to do doing more. Kind of like the idea that exercise is supposed to create more energy, I'm hoping that pushing myself to do a little more will create the "want-to" to do even more. and then just let these guys sort it all out for the week. Problem is though that I think there would be twice as much to do when I got home, to catch up. Because I really don't think anyone here, as much as I love them 'gets' how much work is in a week - because they don't do it.